We are a global company with over 1,500 stores worldwide. We’re not just a British brand, our international side is booming and we are opening 50 new stores internationally each year. into putting in a structured graduate scheme. 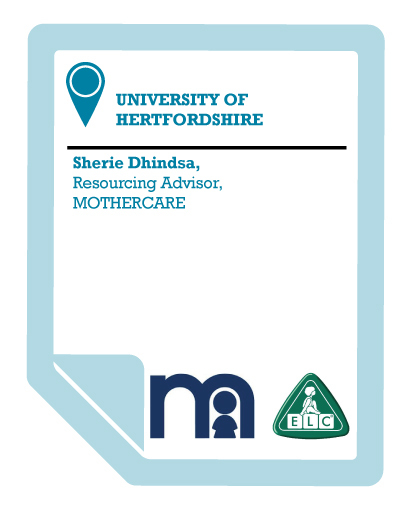 We started engaging with University of Hertfordshire because it is located close to us and because we want to attract good students to Mothercare. The University offers a wide range of different courses – for example, product design, business courses, finance and fashion, all of which fit with different roles at our business. Initially, Hertfordshire approached us and invited us along to their recruitment fair. It was good speaking to the students and we ended up taking six on that summer, in placement or permanent roles. I thought there’d be students reluctantly at the recruitment fair, who wouldn’t know anything about Mothercare, but that was far from the case. I was pleasantly surprised because the students had done their research into the company, they were eager and interested in furthering their career and knowing what they could do if they joined us, they came with their CV, it was nice to see that. I have been impressed by the high calibre of students, the relevance of their knowledge, their eagerness to work and the fact that they are commercially aware. Commercial awareness is built into courses at Hertfordshire. It makes a difference that the University will prepare them in what to expect at interviews and at assessment centres. Yes we have a few who have not done their research, but more so than ever they come very well prepared. I would definitely recommend working with University of Hertfordshire, you have nothing to lose and I think you will be pleasantly surprised with the students. We love working with the employability team. I think they do a really good job for the students.